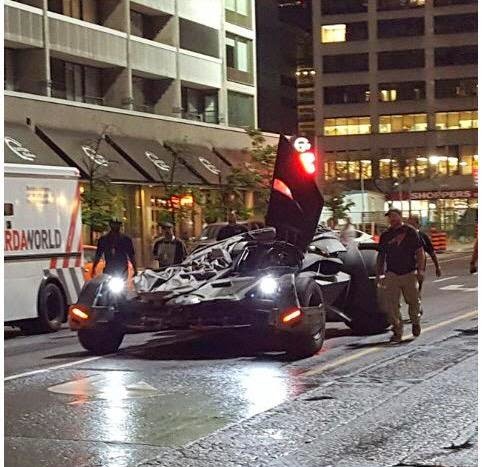 BAT - BLOG : BATMAN TOYS and COLLECTIBLES: #BATMAN #BATMOBILE Spotted in SUICIDE SQUAD Movie! NEWS VIDEO Footage From #SuicideSquad Filming! #BATMAN #BATMOBILE Spotted in SUICIDE SQUAD Movie! NEWS VIDEO Footage From #SuicideSquad Filming! WOW! It looks like Batman and the new Batmobile that will be in the BATMAN V SUPERMAN Movie will also be making an appearance in the new SUICIDE SQUAD film! Here's some Canadian News Channel Video Footage showing a test-run of the new car going through the streets of Canada, AWESOME! !